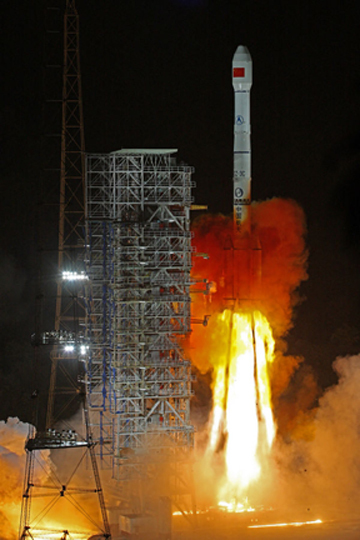 A Long March III rocket carried the 16th Chinese Compass/Beidou2 navigation satellite into orbit from the Xichang Launch Center today at 1533 GMT (11:33 a.m. EDT), according to the official GNSS website at www.beidou.gov.cn. The geostationery satellite successfully entered a planned transfer orbit. This is the sixth Compass satellite launched this year, with a constellation of six satellites in geostationary orbit, five in inclined geostationary orbit (IGSO) and five in medium Earth orbit (MEO). 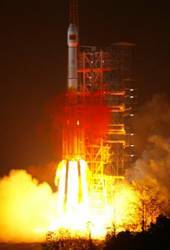 Two MEO BeiDou satellites launched on September 18, have already begun transmissions. According to govenment sources, the sixteen satellite constellation culminates "step two" of a planned three step program. The system will provide regional Asia Pacific service by early next year. The third step, global coverage, is expected to be completed by 2020. Watch the launch video on the Beidou website.